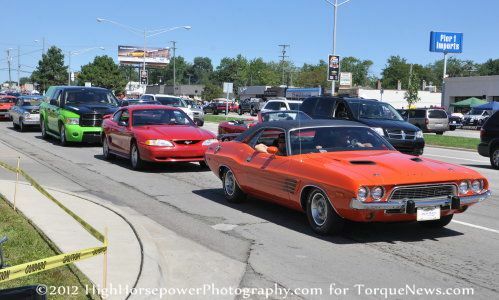 After a week of festivities in the metro Detroit area, the 2012 Woodward Dream Cruise has come to a close and once again – the Chrysler Group and Ford Motor Company displays were among the bigger and best along the multi-mile cruise route. The Woodward Dream Cruise is a massive rolling car show that lumbers through a variety of towns in the metro Detroit area and while the main attractions are the tens of thousands of modern and classic cruisers, the displays along the cruise route have become as popular as the on-road event itself. There are displays of every size and type along Woodward Avenue but every year the Ford Motor Company and the Chrysler Group put together displays that easily trump any other setup along the Dream Cruise route and 2012 was no exception. For those who have never been to the Woodward Dream Cruise, the Chrysler Group and Ford Motor Company have two very different displays – both of which are gigantic yet distinctly unique from each other. General Motors also puts together a display at 13 Mile and Woodward but it is significantly smaller than those areas dedicated to the cross town rivals, including strictly company owned high performance vehicles from the current lineup. The Chrysler Group sets up shop in a large parking lot at the corner of Woodward Ave and 13 Mile road with a massive mix of both privately owned vehicles and company owned vehicles – both from the past and present. This year, Chrysler filled their display with over 75 vehicles old and new along with a variety of attractions including opportunities to get a picture of yourself with your favorite Chrysler products and some free stuff for enthusiasts. There is also a collection of vendors selling Mopar branded apparel. From modern police cars to antique pickups, from the V10 Drag Pak Mopar Challenger to the 2013 SRT Viper GTS – the Chrysler display offers a walk through the history of the Mopar world and a compact, easy to enjoy area. The Ford Motor Company display doesn’t fill a parking lot – instead having their huge display run along 9 Mile road on both sides of Woodward Avenue. On one side of Woodward, the Ford display features a stage with live local bands, a collection of food vendors, tons of fun for the kids with a bunch of bounce houses and a Built Ford Tough truck display. The other side of the Ford display begins with an area featuring the Ford Mustang including the Boss 302, the Shelby GT500 and the rest of the Mustang lineup. Next, there are a handful of displays offering show goers a chance to check out the latest and greatest models in the Ford lineup and a large apparel trailer with all sorts of goodies. Ford also has a parking lot of their own along 9 Mile, with more high performance Ford models, a remote control car track and a chance to meet drift champ Vaughn Gittin Jr. Finally, the Ford WDC display includes Mustang Alley – a long stretch of the road lined on both sides with gorgeous privately owned Mustangs from 1964 to the present. There are hundreds of privately owned Mustangs in Mustang Alley but our FB gallery has a look at just some of them, along with a look at the corporate portions of the huge display. The gallery on the right offers a look at just a few of the vehicles to cruise Detroit’s Woodward Avenue but below are links to galleries of each of the Big 3 displays – with a good look at the incredible Chrysler and Ford displays from the 2012 Dream Cruise. Click any of the links below (each will open in a new window) to look at the huge galleries on the TorqueNews.com Facebook page in high resolution and don’t forget to “like” the page while you are there! Click here for a look at the Chrysler Group display. Click here for a look at the Ford Motor Company display. Click here for a look at the GM display.